As 1945 dawned most German soldiers knew that the war was lost. The Ardennes Offensive was spent and German forces were in retreat on all fronts. Their homes and families were being subjected to constant bombing that reduced German cities to rubble, yet they continued to fight on. On the Eastern Front there was no question of getting any quarter from the Russians and the main issue became delaying the Russian advance to allow as many refugees as possible to escape to the West. Despite the constant aerial bombardment, German industry continued to crank out the means to wage war with ever changing technological advances such as jets, rockets and other “wonder weapons.” And despite the havoc wreaked on transportation infrastructure, the German soldiers were still remarkably well equipped. Fuel was their greatest shortage. The machinegun crew here is equipped with the MG 42 light machine gun which was one of the most dreaded weapons that Allied Infantry faced. The MG 42 was lightweight, easily produced, and had an extraordinarily high rate of fire of around 1200-1300 rounds per minute (22-26 rounds a second). The expended brass next to the weapon on display represents the equivalent of a one second burst of fire. The MG 42 featured a quick change barrel system which allow for almost continual operation. Two spare barells are at the ready in this display. The MG 42 was well designed and effective and continues in service with many countries today. The two soldiers are wearing camouflage uniforms typical of those issued for the Fall and Winter in Europe. The gunner is wearing the woodland camouflage pattern reversible to winter (white) while the assistant is wearing the marsh pattern camouflage uniform which is also reversible for winter. The gun position has the typical trappings of the Infantry; a panzerfaust, grenades, field packs, shovel, camouflage ponchos, and related items. A Late war poster telling the people that the SS is ready to defend, a far cry from the message of the early days of victory and conquest. An example of the message that was the norm for very late in the war. 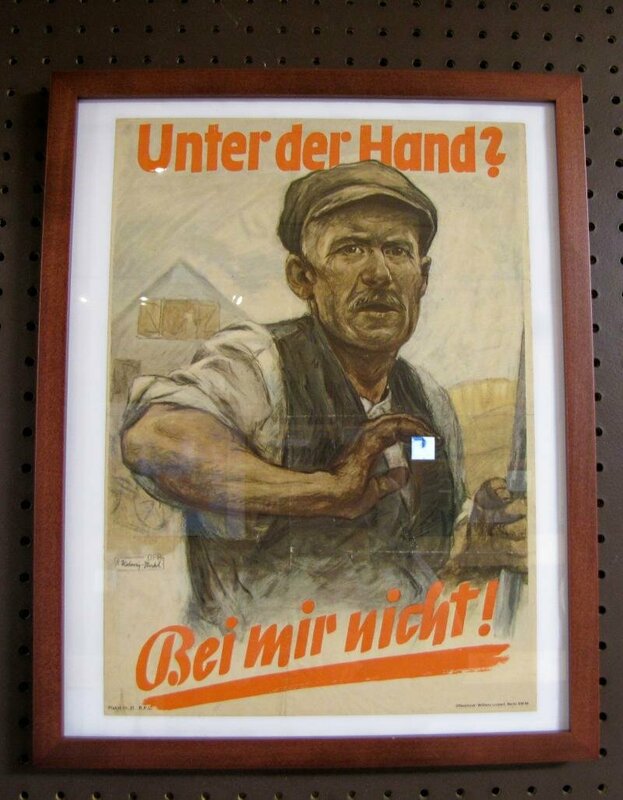 An elderly German responding to the prospect of living under the heavy hand of defeat "Unter den Hand?" Not me. 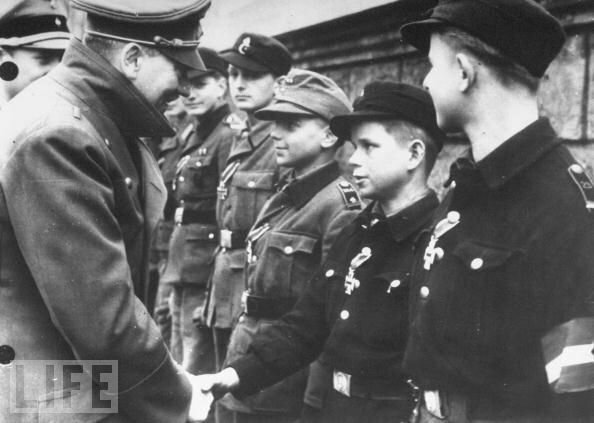 One of the last kown pictures of Hitler in May 1945 awarding medals to HJ in Berlin. 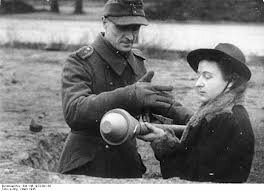 A German woman getting basic training on how to fire the Panzerfaust. The ultimate victims, children who grew up with the constant message of service to Hitler. In the final stages of the war the Hitler Youth were mobilized and thrown into battle to defend the dying Third Reich. They proved to be dangerous adversaries as they were embedded with a belief in the cause and a Panzerfaust. Here a Hitler Youth as the last tline of defense. Armed with a panzerfaust and whatever weapons could be scraped up, they were thrown into the battle with Volksturm in the final days of the war. The HJ distinguished themselves in several engagements on the Eastern front as the Russian closed in on Berlin. This HJ defender above is wearing a Luftshutz (Air Defense) helmet as they were easier to obrtain than the regular combat helmet and he is armed with a panzerfaust. 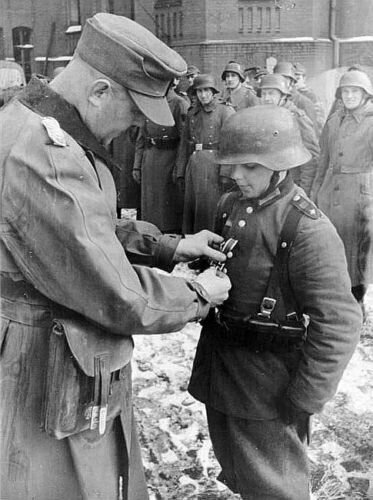 Below a young HJ soldier recieves the EK 2 in the final days of the war for valor in combat. It was as low as the NAzis could go.